Shiro-Khorshid Forever - شيروخورشيد تا ابد: Saudi Women's Big Victory: To Drive after Long Fought Battle with the Saudi Dictatorship! 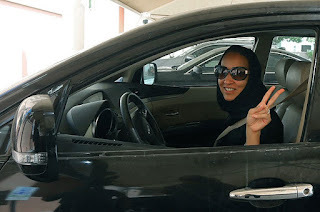 Saudi Women's Big Victory: To Drive after Long Fought Battle with the Saudi Dictatorship! After a decades long fight by women and male Saudi activists, the Saudi dictatorship has been forced to take a step back, and give the hard won right to drive to women of Saudi Arabia. After decades of Saudi activists both men and women fighting for the right of women to be able to drive in Saudi Arabia, they have finally won! The Saudi dictatorship has been forced to take a step back from its oppressive laws and give women the hard fought right to drive. Until now Saudi Arabia was the only country in the world that did not allow women to drive! This is a great victory for the women of Saudi, I am so proud and humbled by their dedication and persistence in the face of persecution to obtain the what is rightfully theirs. Women of Saudi are a great inspiration and a ray of hope to the women in Iran who have led their own decades long fight against the Islamic dictatorship in Iran. Over the last three (3) decades women of Iran supported by many Iranian men have forced the government to take steps back and make concessions that they would not have made otherwise. I am inspired by all these brave women and can only hope to be as brave and strong as they are. Big victory for women of Saudi Arabia today! YOU DESERVE IT!